L. Alloway, "Art," The Nation, December 4, 1972. 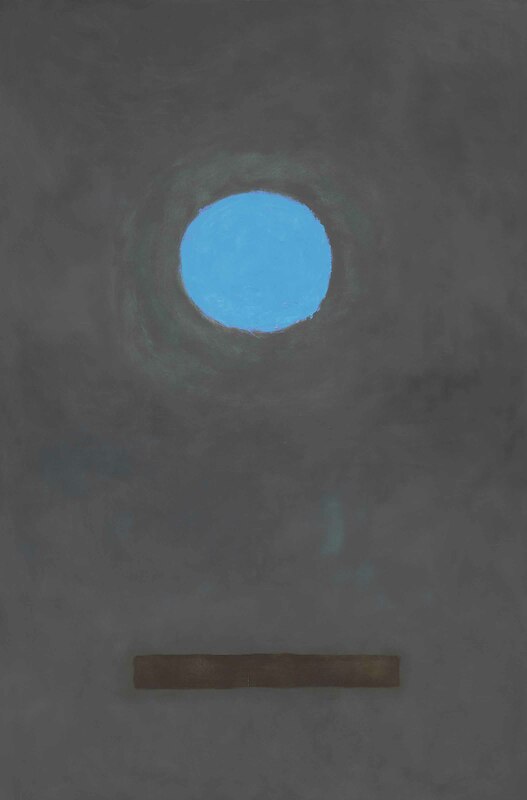 New York, Marlborough Gallery Inc., Adolph Gottlieb Paintings: 1971-1972, November-December 1972. Toronto, Marlborough-Godard Gallery, Adolph Gottlieb Paintings: 1971-1973, October 1973 (illustrated in color). Pewter of 1971, a stellar work from Adolph Gottlieb's celebrated Blast series, exudes an imposing monumentality of form that burst forth from the canvas. Gottlieb's signature series of Blast paintings represent the culmination of his career as one of the most influential members of the New York school, a pioneer of Abstract Expressionism. Gottlieb generates an elemental tension between the forms. Another example from the series, Blast I of 1957, is part of the permanent collection Museum of Modern Art in New York. Gottlieb dedicated himself almost exclusively to exploring this pared-down format from 1957 until 1960, drawing a range of expressive effects out of this duality of form through his powerful imagery and manipulation of form. The opposing abstract forms Gottlieb rendered in Pewter clearly reverberate with the tension of the Atomic Age. Indeed, Gottlieb's Blast paintings offer arguably the most compelling abstract interpretation of the atomic blast in Post-War art. Both segments of the canvas seem to radiate with quiet energy, from the halo that glows in the upper form to the black force field that has detonated below. Gottlieb's earlier Pictographs were created in the wake of Pearl Harbor, and he reacted to the widespread pain and fear this national tragedy generated by asserting, "That these feelings are being experienced by many people throughout the world today is an unfortunate fact, and to us an art that glosses over or evades these feelings is superficial or meaningless" (A. Gottlieb, quoted in "The Portrait and the Modern Artist," October 13, 1943, broadcast on Radio WNYC, Art in New York program). Gottlieb's Blast paintings, created in the wake of World War II, at the height of the Cold War, seem to express the unfathomable fallout of Hiroshima and Nagasaki. He was keenly aware of this association, but he also claimed that viewers should not exclude other readings. The painting's binary structure generates associations with a wide range of elemental oppositions, from the conflict between heaven and hell to the mythological clash of Apollonian and Dionysian forces or the eternal cycle creation and destruction. The paintings' expansive yet concise forms offered Gottlieb an ideal opportunity to convey his prodigious command of color and composition that he had honed over several decades of concentrated engagement with abstract painting. Both elements of the composition radiate with an intensity that exceeds their physical boundaries -- the upper disc pulses from an encrusted core of cool blue to generate a halo of residual color, while the graphic surge of black paint below emits a sense of quiet destruction. Like Rothko, the edges of Gottlieb's color fields offer some of the most scintillating passages in his paintings, such as the halo of thinly applied blue paint briming with energy and the lively trickles of paint dancing around the weighty expanse.